The incident was captured by media helicopters. Two state troopers from Massachusetts and New Hampshire were arrested Tuesday after being seen on TV news video allegedly beating a suspect who had surrendered following a high-speed chase in Nashua in May, amid heightened scrutiny nationwide of the use of force by law enforcement. New Hampshire Attorney General Joseph A. Foster’s office said Massachusetts Trooper Joseph Flynn, 32, and Andrew Monaco, 31, his counterpart from the Granite State, were booked on assault charges stemming from the violent capture of Richard Simone Jr., 50. Simone, of Worcester, had been wanted on assault and larceny charges when he led authorities on a chase that began in Central Massachusetts and ended in Nashua. Troopers struck him repeatedly after he exited his vehicle and knelt on the ground, in an incident that was captured on camera by news helicopters and watched by viewers across the nation. Flynn and Monaco, who are both on leave from their jobs, posted cash bail and are slated to be arraigned in the Ninth Circuit Court District Division in Nashua on Sept. 13. Monaco’s lawyer declined to comment, and Flynn’s attorney did not respond to inquiries. The New Hampshire attorney general is launching an investigation after video surfaced Wednesday of police in Nashua punching a suspect. The arrests drew a swift response from New Hampshire Governor Maggie Hassan’s office. “The incident in question raised serious concerns, and the attorney general appropriately conducted a thorough investigation,” said William Hinkle, a spokesman for Hassan, in a statement. Massachusetts Governor Charlie Baker’s office referred questions to law enforcement officials. David Procopio, a spokesman for the Massachusetts State Police, said in an e-mail that Flynn is a four-year veteran of the agency who remains suspended with pay. It was not immediately clear how long Monaco has been a New Hampshire trooper. Procopio said there had been no similar excessive force cases against Massachusetts state troopers in the last several years. Jane Young, a senior assistant attorney general in New Hampshire, did not cite any previous excessive force charges against troopers in her state, but noted there have been such incidents involving municipal police officers. She said no additional arrests are expected in the pending Simone case. Asked if Simone or any law enforcement officers who took part in the chase will testify if the case goes to trial, Young said she could not discuss specifics, adding that “any witness [with] firsthand knowledge” of a case is normally called to the stand. Simone remains in custody in Massachusetts after pleading not guilty to assault charges stemming from an incident in Millbury days before the chase, in which he allegedly swerved his vehicle at an officer. His lawyer, Joseph F. Comenzo, declined to comment on the arrests of Flynn and Monaco. 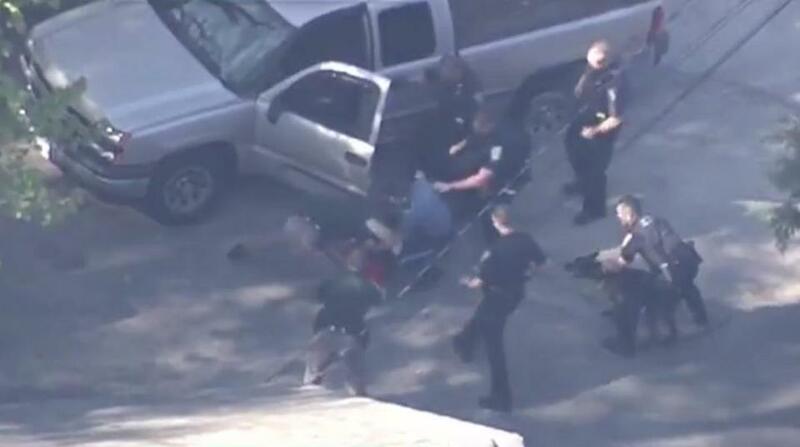 Several police officers appeared to be involved in the chase, which began in Holden, Mass. Police in Holden tried to pull Simone over, but he failed to stop, authorities said, sparking the pursuit that ended about 50 miles away in Nashua. In the TV news video on May 11, Simone is seen bumping his pickup truck into a police cruiser during the pursuit before finally stopping on a residential street. 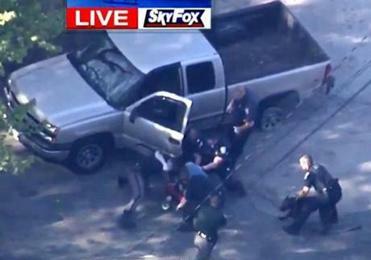 He is later seen slowly getting out of the truck, as officers close in with guns drawn. Once he drops to his knees, several officers rush toward him, and at least two are seen repeatedly punching him. Asked if his client plans to file a lawsuit, Comenzo said, “at this point he’s focusing on the criminal matter” that he faces in Massachusetts. Flynn’s union declined to comment through a spokesman, and the New Hampshire union that represents Monaco could not be reached on Tuesday. The two troopers also could not be located for comment. Their arrests come after recent fatal shootings by police under questionable circumstances in Louisiana and Minnesota and killings of officers in Dallas and Baton Rouge. Those cases followed the controversial killing of African-American men by police in recent years in Missouri, South Carolina, and elsewhere. The wave of slayings has prompted demonstrations across the country in solidarity with both the Black Lives Matter movement and law enforcement groups. While racial tensions have underscored several of the cases, Simone is not a person of color. Howard Friedman, a prominent civil rights attorney in Boston who represents plaintiffs in lawsuits alleging police brutality, said prosecutors were compelled to bring criminal charges in Simone’s case because of the video footage. Andy Rosen of the Globe staff contributed to this report. Travis Andersen can be reached at travis.andersen@globe.com. Follow him on Twitter @TAGlobe.